You can only travel through and around Venice – with its characteristic bridges and alleyways – on foot, by bicycle or using one of the famous vaporettos that navigate their way along the canals and connect the lagoon to the various neighbouring islands. However, you can get close to the hotel either by car, by train or by air, before making your way to our hotel on foot or by boat. Once you reach Venice’s Santa Lucia train station, take Line 1 or Line 2 heading towards the Lido and then get off at the Vallaresso San Marco stop. The boats run every 10 minutes and the journey time is around 30 minutes across the Grand Canal; after 9pm, the boats run every 20 minutes; and from midnight onwards, you should use Line N (the night line). 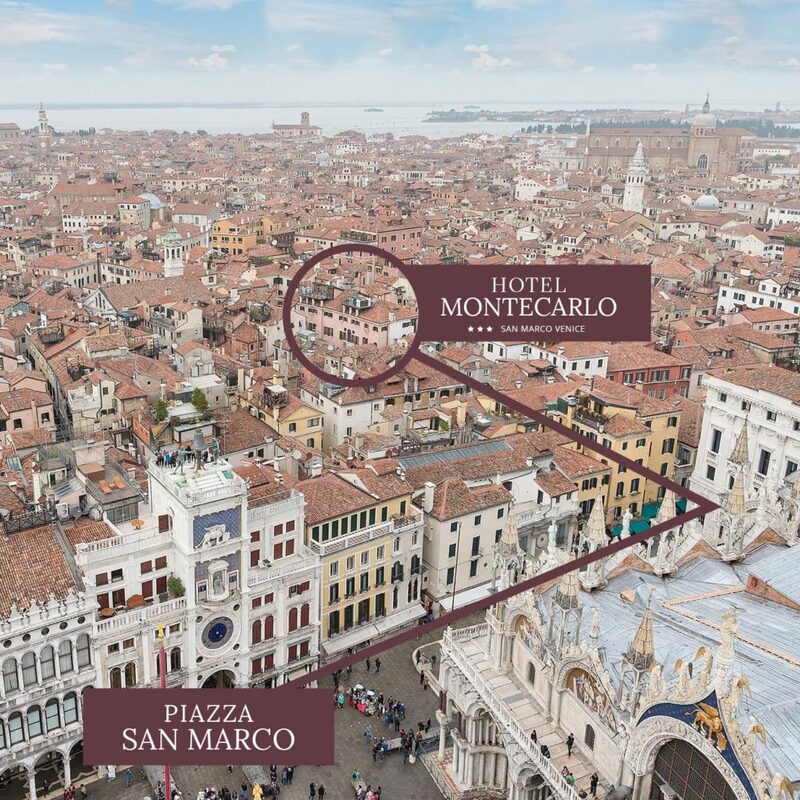 On St Mark’s Square (Piazza San Marco), pass under the Clocktower (Torre dell’Orologio) heading towards the Rialto, then turn right into Calle Larga San Marco and then left into Calle degli Specchieri, where you will find Hotel Montecarlo. From Venice’s “Marco Polo” Airport, take one of the Alilaguna-line motorboats that go to St Mark’s Square (Piazza San Marco). The boats run every 30 minutes and the journey time is 60 minutes. At the motorway exit, follow the signs for Venice – Piazzale Roma (vehicle terminal). Leave your vehicle in one of the garages in Piazzale Roma. From here, you can use the water taxi or you can use public transport, in which case take Line 1 or Line 2 heading towards the Lido and then get off at the Vallaresso San Marco stop. The boats run every 10 minutes and the journey time is around 30 minutes across the Grand Canal; after 9pm, the boats run every 20 minutes; and from midnight onwards, you should use Line N (the night line).